Indeed, the last three months have seen the group produce an excellent rise to form. The side had a tough start to the year, finishing their grading games with five losses, coming up short against opposition who were organised and prepared earlier. 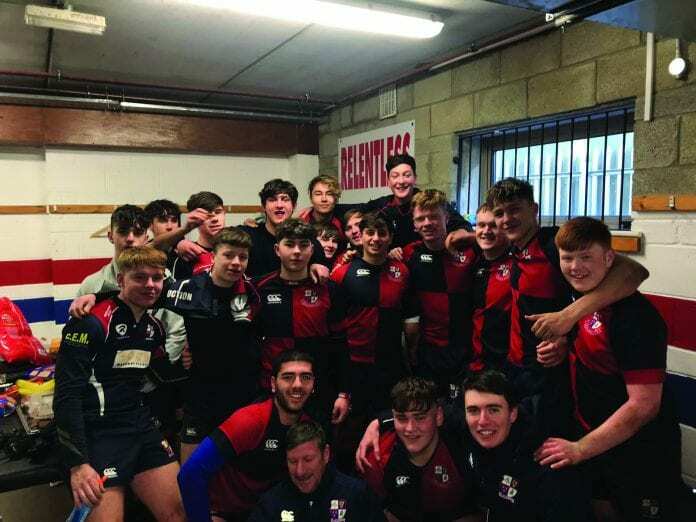 Joe Walsh took on the side at that stage and they started to assemble in earnest with a full-day visit to Rugby Academy Ireland in Naas, taking in three fitness sessions and team-bonding work. They went on to beat Ashbourne 22-20 in December in a friendly, the first victory for the club since January earlier in the year, an uplifting experience for the side. They followed up with another friendly win against NC Wasps, 17-5, to build the momentum going into the league which began on January 6. A strong start put Coolmine 12-0 up before Naas could get into the game. Some superb variations in attack, accurate set piece work, and a strong defensive effort gave them a first league win, finishing 34-15. A walkover against Suttonians added to their record. There was a setback in the School/Youth Cup at Wicklow, bowing out despite a very strong first half performance to be in the game at 17-12. It meant focus shifted back to the league, beating Greystones in early February. They started strong, asserting themselves up front, and moving the ball well across the park. At half time, they held a 36-0 lead away from home. A good second half effort, despite a few defensive errors, finished the game with a final score of 55-12. It set up a final group game against NC Wasps at home in Ashbrook with motivation and preparation at an all-time high. They eventually won 26-10, completing their perfect group stages, fronting up all over the park with their sports analysis returning great stats on their performance – a breakdown accuracy of 94%, and a passing accuracy of 86%. It led to tries from Philip Thornton, Oisin Tierney, Liam Martin and Aleks Makarevich as well as three from four conversions from Donal Gilmore. The win vs Wasps meant a first place finish unbeaten, and a guaranteed home semi-final against the second placed team in the other pool. “We have seen a massive transition over the last few months from the hunted, to the hunters, and we are hungrier than ever to show that we’re here to win, and we’re here to win silverware,” said coach Walsh of their performances to date.